Review: Is it worth upgrading your older Mac to OS X 10.7 Lion? One of the great things about owning a Mac is that for most tasks, you don’t suffer the same slow down that can be suffered by many Windows users. A Mac bought four years ago can still happily run many of today’s productivity and design applications. Also, buying a Mac can be a relatively large investment, particularly for students – so you don’t want to junk it every time Apple release an upgrade. Of course, it’s not just the processor and RAM – what if you don’t have a newer glass trackpad with multi-touch, or an SSD? So what does today’s launch of Mac OS X Lion mean for users of older Mac hardware? Firstly, the minimum system requirements are very similar to OS X 10.6 Snow Leopard. 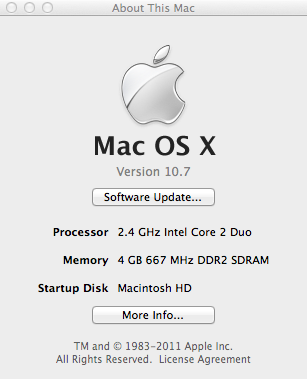 The most important change is that you’ll need at least an Intel Core 2 Duo to run Lion. This means users with the very first generation of Mac and Intel hardware (Core Solo/Core Duo) are excluded from the upgrade. Also, while you can get away with running Lion on 2 GB RAM, experience from Snow Leopard suggests 4 GB is a comfortable minimum for multi-tasking. You’ll also have to be running Mac OS X Snow Leopard, version 10.6.8 to install Lion. Even if you want to do a clean install, you must download Lion via the App Store first and then follow the various guides. 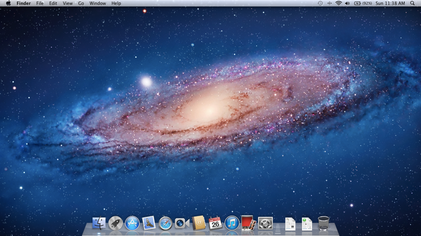 This morning, I took the plunge and installed Mac OS X Lion on my late-2007 MacBook Pro (2.4 GHz Core 2 Duo, 4 GB RAM). 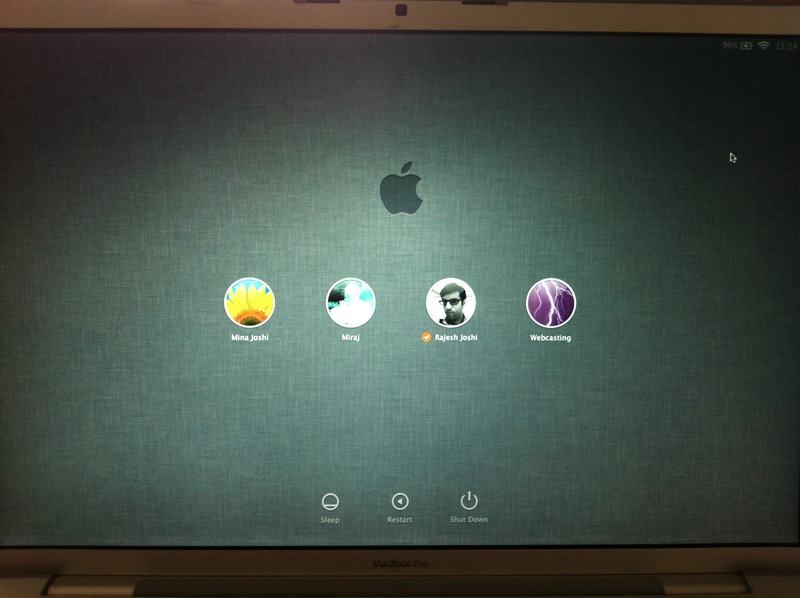 It wasn’t a clean upgrade – in fact, I’ve upgraded it from Tiger to Leopard (on launch day) and then to Snow Leopard. The upgrade process was pretty smooth and didn’t require any input from me. A little over half an hour later, I was presented with the smooth iOS-style login screen. Login was characteristically a slow experience – this is one thing that could be quicker, but I do have a number of apps that I set to launch on login, like Twitter for Mac, Chrome and the usual like Dropbox etc. Experience suggests a reboot and login is a pretty rare occurrence, so I’ve never been bothered by this. However, this is where the problems seemed to start: Chrome was slow, sluggish. Twitter was updating slowly and I could hear my hard drive clunking away. 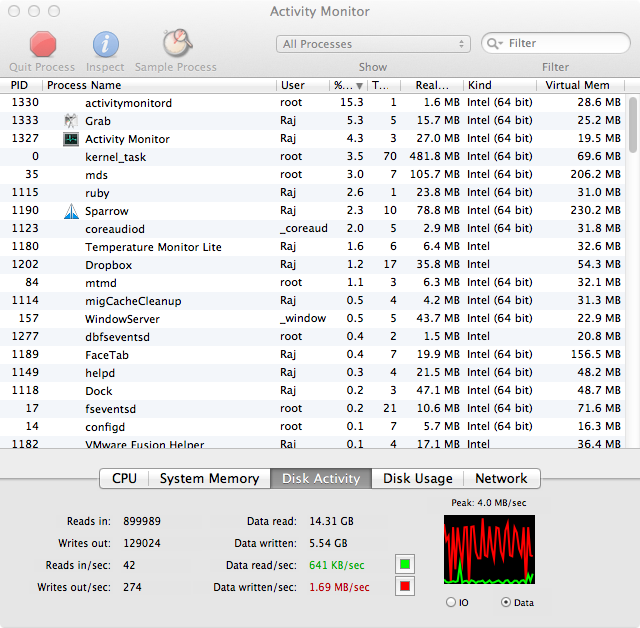 Opening Activity Monitor, my processor usage wasn’t particularly high, but my hard drive was being ragged fairly hard. In retrospect, this wasn’t too surprising – I had just installed a near 4 GB update to my operating system. A bit of advice from Twitter and this article rightly identified that it was simply Spotlight re-indexing my hard drive; given that it’s not particularly large, this only took about 15 minutes before things seemed to return to normal. Beyond that, there don’t appear to be any major performance issues, despite the fact that my Mac will be at least initially transparently rebuilding its caches and defragmenting key operating system files. So far, I can’t use any new gestures as I don’t have a multi-touch trackpad. I’ve also turned off the iOS “scroll wheel” style scrolling through System Preferences (it’s labelled “Content moves in the direction of finger movement on touch-pad or mouse”). I guess if I ever start using my Magic Mouse again, I might change this, but for now, this isn’t something new I want to learn. Users desperate for gestures may benefit from a Magic Trackpad. As for other new features, Mission Control works smoothly and as expected, unifying my ill-used Spaces and application windows. I also like the fact that Dashboard widgets appear in their own space (you can turn this off). I haven’t seen much evidence of iOS-style ‘instant’ switching to apps, though Word for Mac 2011 and Photoshop CS3 did both bring up the last few documents and images that I worked on when I quit and restarted the apps. The Launchpad also works smoothly, but for me, this feature is far less useful than using a launcher like QuickSilver as a launcher/Spotlight replacement. Launchpad is marginally quicker than using the Finder to launch apps, but QuickSilver’s “double-tap and type” is much quicker and targeted than Launchpad’s full-screen browsing of all my forgotten apps. 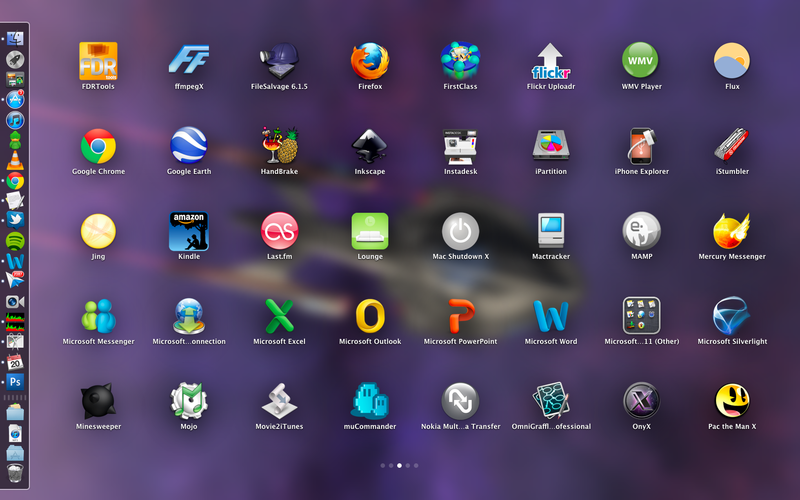 But what about the other bundled apps with Lion – like the new Mail, iCal and all the other small upgrades? As a user of Sparrow, I don’t foresee using the Mail app, which shares many similarities with Sparrow already, but isn’t quite as slick when it comes to supporting Gmail specific features. 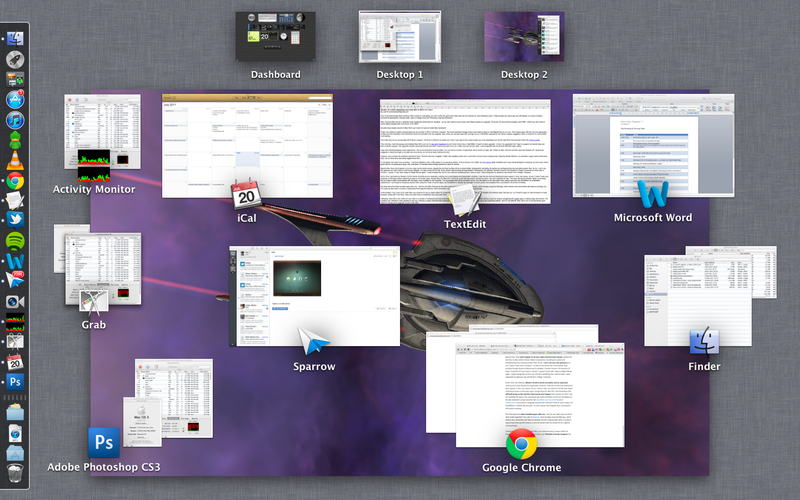 iCal’s full-screen view is a dream for at-a-glance viewing though. Ultimately, what OS X Lion offers for your Mac is a number of enhanced and improved features including, Auto Save and Versions which will be a boon for anyone struggling with crashy apps or editing large documents. The updated user interface is also pleasing to the eye, offering a crisper interface that continues to make Aqua one of the most pleasant UIs of any operating system. And for just $29.99 or £20.99, Mac OS X Lion is comparatively good value for money as an upgrade for your older Mac. Download it from the App Store now.